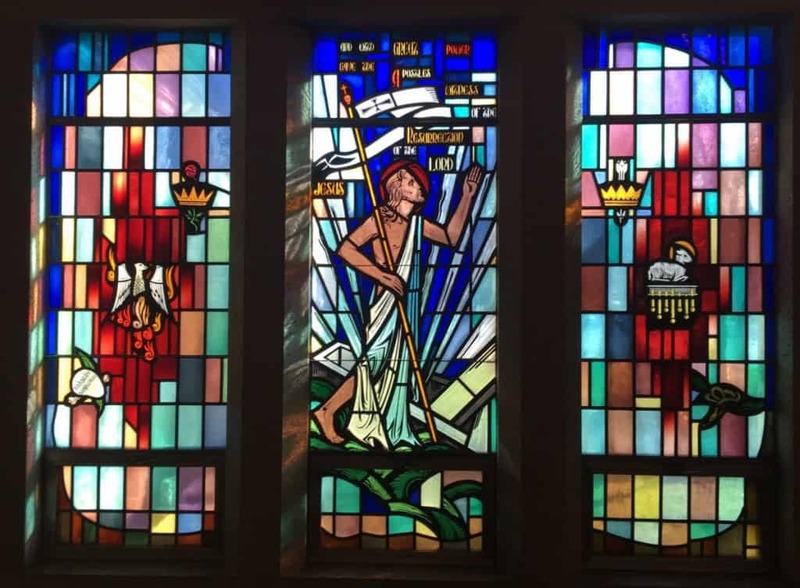 Winona is known as the Stained Glass Capital of North America, and Central Lutheran’s windows reflect that proud heritage. The windows were designed by Eugene Marggraff and installed by the Conway Universal Studios. They were dedicated on May 22, 1955. Glass imported from England, France, and German was mouth-blown and contains many small bubbles and variations that deflect the light and color. Some of the glass is thick Norman Slab which produces deep rich colors. The windows tell the story of God in relationship to God’s people. More Stained Glass window details. 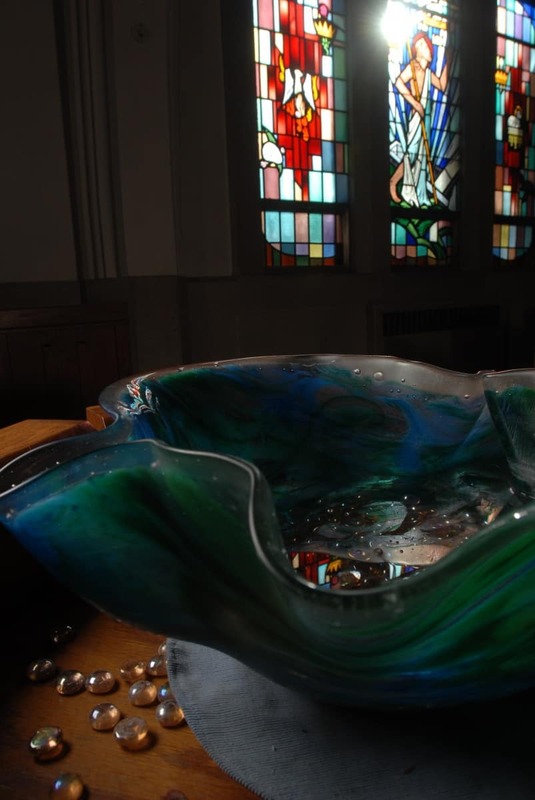 Central’s kneelers surrounding the communion rail are a singular artistic achievement unified around the Baptismal themes of water and represented by scenes from both the Mississippi and the Jordan rivers. As Christians we associate this mighty river of North America with the Jordan River of ancient days: the new and the old, East and West, our past and our present. In our life’s journey and in the annual journey through the Church’s year, these two significant rivers come together and merge into our soul. Designed by artist Mary Ellen Kitundu and stitched by 21 volunteer women over the course of two years, the project comprises 30 single cushions and two double cushions. 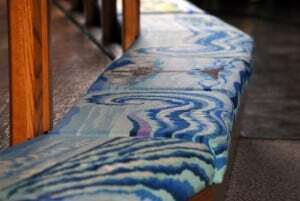 Each single cushion is about 504 square inches and required approximately 6,024 stitches or about 300 hours of work. Each double cushion is about 936 square inches and required 11,522 stitches or about 600 hours of work. The total time required to complete the project was about 9,000 hours. The cushions were dedicated to the Glory of God and set in place on the Feast Day of Christ the King, November 24, 1996, in the 125th Anniversary Year of Central Lutheran Church. Designed by Mary Ellen Kitundu, the stoles were created in sets of three for the seven liturgical seasons of the Church year: Advent, Christmas, Epiphany, Lent, Easter, and Pentecost. The vibrant colors compliment the altar cushions and the pulpit fall as well as the stained glass windows. The Pulpit Fall represents the four major seasons here in Winona: fall, winter, spring, and summer. The river in the cross represents the grace of God that flows to us through the death and resurrection of Christ. This flows to us night (as represented by the stars and moon) and day (as represented by the sun’s rays) every season of our life. The church has often used the sun to represent the Son of God, thus the sun is in the middle of the cross. The water of grace that flows downward is in coordination with the river that flows around the communion rail. 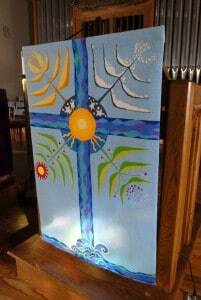 This piece is based on a cross designed by well known church artist and author Gertrud Mueller Nelson from San Diego. She was born in Germany and raised in Saint Paul, Minnesota. The piece measures 28.5 inches by 44 inches for an area of 1,254 square inches. This would involve 180,576 stitches and 746 hours of work to complete. When the Pulpit Fall was completed and the stoles were in process, it was decided to dedicate the entire project on Christ the King Sunday, November 23rd, 2003. This was seven years after the dedication of the altar cushions in November, 1996. More Needlepoint Stole & Pulpit Fall details. Hammered pewter paten & pouring chalices as well as individual cups are used Sundays. The hand-blown crenelated glass basin of blue, green, and pink hues rests atop an octagonal wood stand.